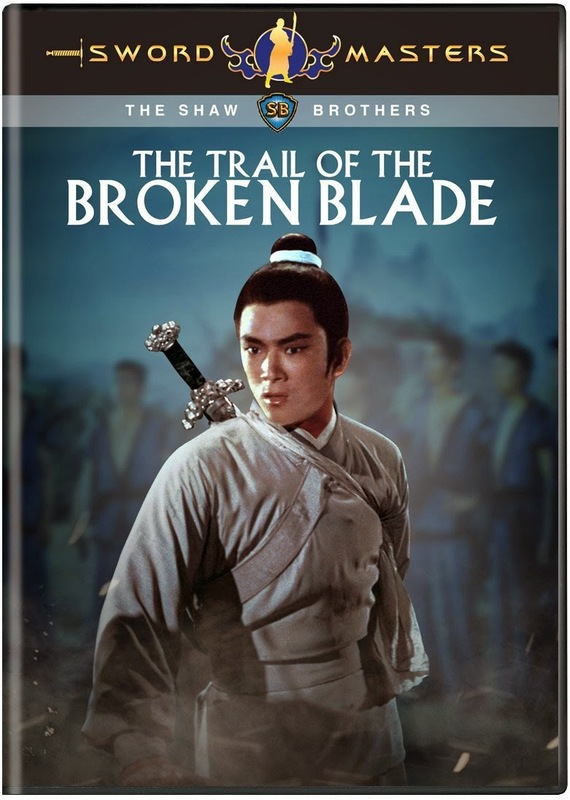 Trail of the Broken Blade is a Shaw Brothers film released in 1967. Directed by Chang Cheh (The One-Armed Swordsman, Golden Swallow and The Five Venoms), the film stars Jimmy Wang (The One-Armed Swordsman, Golden Swallow and Chinese Boxer), Lisa Chiao Chiao (The One-Armed Swordsman), Chin Ping (The Magnificent Trio, The Sword and the Lute), Chiao Chuang (King Cat), Tien Feng (The Shadow Whip, Raw Courage,and The 14 Amazons), Paul Wei and Chen Hung-Lieh (Come Drink With Me). The film's first scenes are initially confusing, but the plot soon becomes clear. It begins with Li Yueh (Jimmy Wang) killing an imperial official responsible for a false accusation that led to his father's execution. This is a murder of vengeance, and clearly a just end for a corrupt man. The act forces Li Yueh to go into hiding as wanted posters with his likeness are pinned across the empire. Next we are introduced to the other major characters. Li Yueh has already assumed a new identity and we encounter the son of the master of Flying Fish Island, Tu Hu, who sets his sights on Yueh's former love, Liu Chen-er (Chin Ping). As Tu Hu and his men start a row the Liu family villa, wandering swordsman Fang Junzhao (Chiao Chuang) of Wudang arrives and fends them off. In the battle he wounds Tu Hu with a dart, forcing him to flee in a bloody trail. Tu Hu makes it back to Flying Fish Island, as his father is killing some prisoners and testing out his new black net technique. He clings to life long enough for his brother, Tu Long (Chen Hung-Lieh), to embrace him as he dies. Their father, Master Tu Qian Qui (Tien Feng), examines the dart and concludes it belongs to Fang Junzhao. Tu Long vows revenge and takes a group of men with him called Jiao's Four. In the meantime, Fang remains at the Liu family villa where Chen-er's father encourages him to spend time with his daughter, hoping she will forget about Li Yueh. Chen-er realizes that Fang is falling for her, but explains that she wants to be reunited with Yueh. Putting aside his own feelings for Chen-er, Fang vows to find him, no matter how long it takes. Li Yueh has assumed a new identity in a remote town as a horseman for a stable at an inn. There he is in close contact with the owner of a local gambling house named Shi Gan (Paul Wei) and his daughter, Xiao Mei (Lisa Chiao Chiao). Xiao Mei and Hu Zi (who works at the gambling house) have a scheme where they steal the winnings from gamblers who have a good night at her father's establishment. One evening Li Yueh sees them and intercepts their efforts, revealing himself to be a martial expert in the process. He reprimands Xiao Mei but when her father comes to him with a bribe the next day, he realizes he may have exposed himself too much. He smooths things over with Shi Gan, who is worldly but proves to be loyal (initially it is unclear what his intentions or character are). Fang eventually passes through town and notices Li Yueh lift a large trough with just one hand. Impressed he spends time with Yueh and the two become close. Fang believes Yueh has a natural talent for martial arts and wants to take him to Wudang. Tu Long and Jiao's Four arrive in the town and find Fang, facing off in Shi Gan's gambling house. This proves to be an engaging scene, with the gambling hall providing plenty of visual fodder. They exchange banter over a number of games of chance, slicing dice and then fusion them together with Chi energy, before a battle breaks out. Yueh arrives in time to save Fang and kill Jiao's Four. Tu Long flees but promises to return in a month for revenge. Things get a bit complicated as Chen-er follows a trail of her own to the town. Just as she arrives and Fang, Yueh leaves for Flying Fish Island to defeat Fang's enemies for him. In a note he explains that Fang is a righteous man and can take care of Chen-er, that they are ideal for one another, and that he as a man on the run could offer her no real future. The pace picks up considerably here as Yueh slices his way through Flying Fish Island and Fang and Chen-er rush to help him. Yueh faces off with Master Tu while Fang and Chen-er negotiate their way through pits and traps, eventually facing and killing Tu Long. Yueh and Master Ta each deliver a fatal blow to the other and die. When Chen-er finds his body, she takes a sword and kills herself. We then see their spirits ascend together. This is a solid movie, but certainly not Chang Cheh's best effort. Jimmy Wang plays a strong lead as always and Paul Wei stands out as the indecipherable Shi Gan. It was nice to see Lisa Chiao Chiao and Jimmy Wang (who are lovers in The One Armed Swordsman) share scenes, though in Trail of the Broken Blade the love is unrequited. The action is more traditional swordplay, like you see in a lot of these earlier Shaws Brothers films. I rather enjoy this. While I love modern wuxia with its sharp editing, one of the nice things about movies like Trail of the Broken Blade is you can see the actor's entire body and movement in each shot. It isn't nearly as fancy as the stuff we have grown accustomed to, but it is very real and requires a good deal of athleticism from the actors. One downside is mistakes are not as buried by the editing, each misstep is magnified. The swordplay itself is good, but not great either. It has strong moments. However it isn't really the focus of the film. The beginning and end have plenty of action, but the middle of the movie, though it has some brief encounters, is devoted mainly to the characters. The final battle itself is considerably entertaining and has a few surprising moments. The line between good and evil in Trail of the Broken Blade is stark, with The Flying Fish Island sect taking delight in mayhem, while Fang (A Wudang Swordsman) and Li Yue are the epitome of selfless righteousness, sacrificing their own happiness for others. Ultimately it is a tragic story where our righteous heroes are doomed by their very nature to unfulfilling ends. On the other hand, the film's final sequence, where Yue and Cheng-er ascend together as spirits, is hopeful. There seemed to be a theme of righteousness ultimately being rewarded, even if it means suffering in this life. The movie reminded me of Last Hurrah for Chivalry with its focus on true friendship in a world that cynical and filled with betrayals. It is unapologetically sentimental and I have to admit I really enjoy that. One of the pleasures of wuxia is it can walk the line of acknowledging the grim realities of life, pointing out hypocrisy and corruption, but also leaves room people whose hearts and deeds align in moving displays of fidelity. The friendship between Fang and Yue is central to the story. It also serves as a vehicle for highlighting their moral character. In fact all the relationships do this. A common theme in wuxia is putting the happiness of those you care for before your own. Fang loves Chen-er but in order for her to be happy, and because he feels Yueh is a good man, he devotes himself to re-uniting the couple. Yueh loves Chen-er but lets her go because he has no future and knows that Fang would make a worthy husband. Chen-er is willing to die for her love and Xiao Mei, who loves Yue, emulates Fang and works to reunite them toward the end of the movie. This is certainly a confusing network of feelings, but it makes sense as the film plays out and it works well to emphasize importance of selflessness. Trail of the Broken Blade has a lot of classic wuxia elements that can inspire Gamemaster. It really does have it all: love, loyalty, tragedy, grudges and larger than life heroes/villains. The premise of the hero in hiding, would be an interesting way to introduce an NPC but could also arise as a development for a party of characters on the run. The movie highlights some of the challenges such characters might face. This could also work as an adventure, where the players need to track down a person's lover who is in hiding from the law. It creates an interesting basis for an investigation where the PCs would need to be careful so they don't inadvertently bring the person they are tracking down to the attention of authorities. Flying Fish Island would make a spectacular location for adventure, with elaborate traps (including caves filled with poison gas) and a stable of villains worthy of any campaign. I would certainly encourage both game masters and wuxia fans to check this one out.